The MSRDC had subsequently appointed a contractor. However, work could not take off because of lack of required bearings that were to be replaced. The no objection certificate from the traffic department was also pending, officials added. 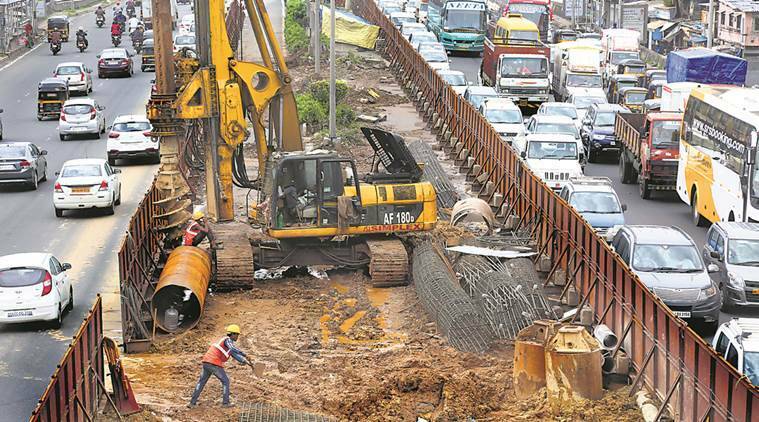 Starting April 20, the Sion flyover will remain shut for vehicular traffic for two months with the Maharashtra State Road Development Corporation (MSRDC) initiating repairs on the structure. A chunk of plaster from the outer portion of the flyover had fallen on the road below on Thursday night. MSRDC officials said the structural audit of the bridge was carried out by IIT-Bombay in 2018. In the report, the institute had recommended immediate repairs. The MSRDC had subsequently appointed a contractor. However, work could not take off because of lack of required bearings that were to be replaced. The no objection certificate from the traffic department was also pending, officials added. Now, with all requisite permissions in place, MSRDC has decided to initiate work in which 170 bearings, which provide a resting surface between bridge piers and the bridge deck, will be replaced. The repair of the 1.1 km bridge will cost Rs 5.2 crore. While the actual work will begin on April 20, the MSRDC restricted the plying of heavy vehicles on the road from Friday. Around 15,000 vehicles ply on the flyover, constructed in 1990, daily. It is arterial for eastern and central suburb commuters travelling to south Mumbai.